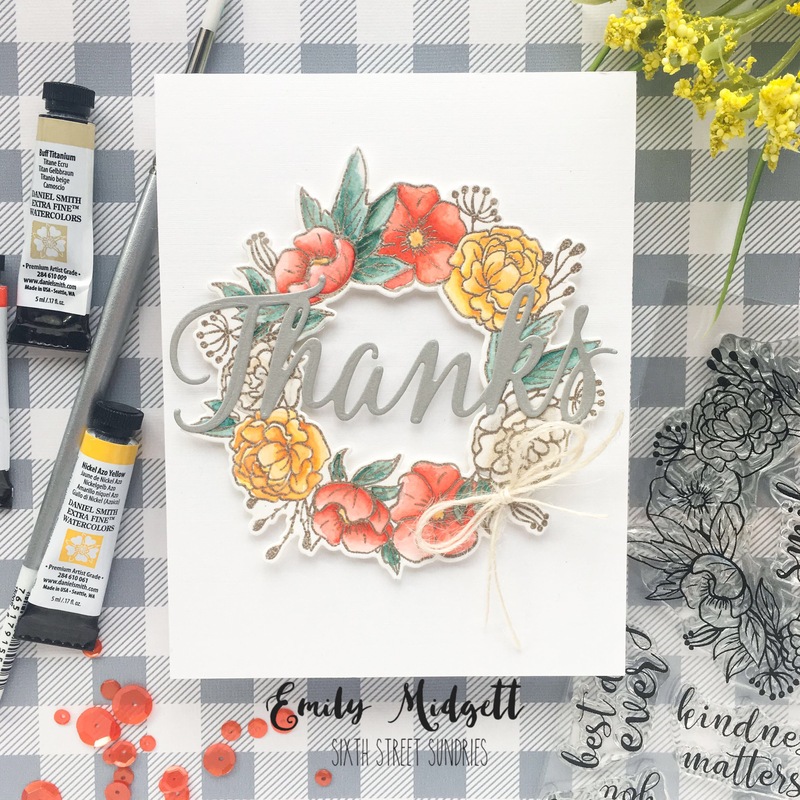 Ellen Hutson May Essentials By Ellen Release! Good morning! I have a special post today… helping to officially introduce the new Essentials By Ellen release for May!! We have some fantastic, versatile pieces to show you, as well as a new addition to the ever-popular Mondo floral line!! My first card features the brand new Mondo Sakura and dies, as well as the new Totally Random Sayings and the new Block Words Dies. I started by die cutting and heat embossing the Sakura Blossom image onto some watercolor paper using silver sparkle embossing powder, then used my Daniel Smith watercolors to add color. I also die cut a couple of leaves from the Mondo Peony and added color to them. I cut the Sakura blossom in half so that I could create a floral frame on my card front. I also stamped a greeting from Totally Random Sayings onto some magenta card stock using the same silver sparkle embossing powder and die cut “friend” from Block Words. I adhered all of the die cuts and greeting elements to a bubble gum colored card base with dimensional adhesive. The final touch was a few jewels from Pretty Pink Posh. For my second project, I wanted to put to use the lovely gingham block included in the Plaid Maker set. I stamped it once on an A2 card base using pale gray ink in the center to use to ground my little deer scene. (I used the Essentials By Ellen Oh Deer stamp set, not realizing that it will be retiring soon! I’ve linked a few other similar stamp sets that could also be used in its place.) I stamped my deer using Copic-friendly black ink, then added some subtle gray shading. I stamped and die cut a few little foliage branches to create a little wreath behind my deer. This background technique would be perfect for a baby card! For the greeting, I die cut three of the Hello dies from Block Words from white card stock and layered them together to create a dimensional die cut. I also added the rest of the greeting from Oh Deer in black. Well, that’s all for me today! I hope you’re as in love with these beautiful new products as I am…. especially that new Mondo Sakura set… divine! All of the new products are now available for purchase in the Ellen Hutson store, so happy shopping!! 🙂 Have a marvelous Sunday!